Solar screens at Houston Blinds For Less offer a great way to block harmful UV rays penetrating uncovered windows and create daytime privacy while still maintaining your view. With a variety of screen and frame colors to choose from, you do not have to sacrifice style when installing solar screens. Houston Blinds For Less can coordinate solar screens with the most simple to the most elegant interiors. With at least 200 days of sunshine annually in Houston, solar screens can really help you lower your cooling costs by stopping the heat transfer through your windows and doors. The fabric of solar screens can also reduce wind chill on your windows, helping to lower heating costs. Add solar screens throughout your home or office and within a short period of time, the screens can pay for themselves in energy savings. 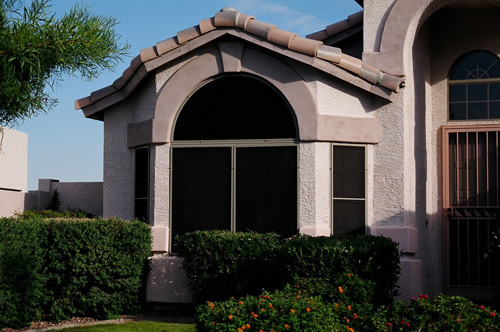 By blocking the sun’s UV rays, solar screens also help protect your home’s interiors from fading. Furniture, draperies, carpet, wood flooring, wallpaper and artwork are a few of the interiors that can suffer the adverse effects of harsh sunlight beaming in through uncovered windows. Solar screen have the ability to provide privacy without obstructing your view. You can see outside, but the screens block prying eyes from seeing inside your home during the day. To maintain your privacy at night, you will need additional window coverings. Solar screens at Houston Blinds For Less are available in different blockage percentages, based on how much light you want to keep out. We offer colonial or divided light screens, depending on the look you prefer. Our solar Screens can also accommodate those hard to cover arches. To learn more about your options for solar screens at Houston Blinds For Less, contact us. We serve the entire Greater Houston area and surrounding cities. Call (281) 997-2100 today!